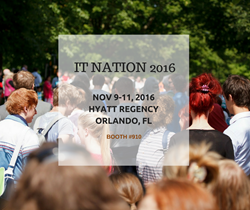 Mindmatrix is sponsoring and exhibiting at IT Nation, 2016 to be held at Hyatt Regency, Orlando, FL on November 9-11, 2016. Matthew Connolly & Eric Weber, MSP Sales & Marketing Enablement Experts from Mindmatrix will be attending the show. IT Nation is the premier conference for technology solution providers and the largest event of its kind, offering a world-class experience for attendees. Matt knows from his experience that most MSPs and IT service providers are too busy helping their clients with their IT infrastructure to find the time needed to engage in effective sales and marketing activities. "They are too busy working in the business to focus on the business and this ultimately hinders the growth of their own revenues," said Matt. "IT Nation offers a great opportunity to educate MSPs, IT Vendors, ISVs, VARS, and others about the unique value offered by Mindmatrix's MSP–IT Advantage Program. We can explain how they can scale up their marketing and sales efforts to drive their business with a minimal investment of time and money." Over the years, Mindmatrix has helped over 100 MSPs and IT service providers become more effective at marketing and selling their IT services, thereby boosting their sales revenues. Under its MSP–IT Advantage Program, Mindmatrix offers Managed Service Providers, VARs, integrators, consultants and ISVs all the tools, strategies, content, and marketing and sales support they need to pursue and close leads effectively. To schedule an appointment with Mindmatrix at IT Nation, 2016, please email sales(at)mindmatrix(dot)net or call 412-381-0230. Event attendees are encouraged to visit Mindmatrix at booth number #910 during the show.